We’re sorry! Booking is now closed for this Owner Adventure. Please call Bluegreen Travel Services at 800.459.1597 to learn about similar Alaska cruise tours. New Departure Added by Popular Request! From $6,064(1)(2) per person, based on double occupancy, Balcony stateroom Only 12 doubles available! 6-night land tour in Alaska’s Interior & 7-night Inside Passage Southbound Cruise, Seward to Vancouver; airfare not included. Single, triple and quad accommodations may be available; ask us about rates. No meals are included on the land portion of this cruise tour. Booking deadline is December 15, 2018, or until sold out. A passport valid for six months beyond the end date of this cruise tour is required for guests on this Owner Adventures vacation. Experience the remote and untamed wilderness of Alaska’s Interior and the stunning landscapes of its coast on Bluegreen’s journey through America’s Last Frontier. This itinerary is the perfect mix of time on land and at sea, which is the best way to see Alaska! The land portion of your journey starts just 200 miles south of the Arctic Circle with a two-night stay in Fairbanks, where you’ll visit the Museum of the North and board a vintage sternwheeler to cruise the Chena River. Watch with excitement as a bush pilot takes off and lands his plane on the water right by your vessel, and see Iditarod sled dogs in training. Next head south on the Wilderness Express® train for a scenic ride to the 6 million wild acres of Denali National Park. You’ll have a two-night stay in Denali and the opportunity to see the park’s freely roaming wildlife, like moose and grizzly bears, and the majestic mountain Denali (if it peeks out from behind the normal cloud cover), on your included Tundra Wilderness Tour. Next you’ll travel south by train from Denali to the artsy village of Talkeetna for an overnight stay, followed by a rail journey to Anchorage, Alaska’s largest city, and an overnight stay in the downtown area. Visit the Alaska Native Heritage Center on your way to Seward to board Royal Caribbean International’s Radiance of the Seas for a seven-night southbound voyage. Enjoy scenic cruising past the Hubbard Glacier, one of Alaska’s most active masses of ice, and three included private group excursions during your cruise. Discover the highlights and pristine natural beauty of Alaska’s capital city on a Best of Juneau & Whale Watching tour. You’ll visit the enormous ice river called the Mendenhall Glacier, seek out humpback whales and other sea life on a whale-watching cruise and enjoy a delicious Salmon Bake before arriving at Juneau’s compact downtown area for shopping or touring on your own. Hear tales of the famous and the foolhardy in Skagway and experience what it was like to seek your fortune during Alaska’s Gold Rush on the Alaskan Gold-Rush Experience excursion. It includes a ride on the historic White Pass & Yukon Route Railroad for a fascinating climb to Frasier, Canada. You’ll also pan for gold at the Alaska 360’s Dredge Town, with costumed “prospectors” to guide you through swirling and sluicing. Those interested in Alaska’s wildlife are in for a real treat when the ship reaches Ketchikan. The Bear Country Wildlife Adventure excursion takes you to the Alaska Rainforest Sanctuary for bear-viewing near a salmon run. Only a limited number of small groups have access to this exclusive area. Your Alaska adventure ends with a Farewell Cocktail Reception aboard ship with your fellow adventurers and disembarkation in Vancouver, British Columbia. Join us and discover the best of Alaska’s mountains, forests, glaciers and wildlife on this Owner Adventures vacation. PLEASE NOTE: While wildlife is abundant in Alaska, wildlife sightings cannot be guaranteed on tours and excursions. Arrive in Fairbanks, called the “Golden Heart of Alaska.” Just 200 miles south of the Arctic Circle, Fairbanks was just a tiny trading post before a miner hit gold. Today Fairbanks is a destination for adventure seekers as the gateway to Alaska’s northern wilds and some of its most isolated terrain. You will be transferred to your Fairbanks hotel and will meet your Bluegreen host and Adventure Specialist, a local guide who knows the territory and will accompany your group every step of the way. Your Adventure Specialist will have suggestions for optional excursions you might choose to personalize the land portion of your cruise tour, including fishing, ATV tours, boat rides, helicopter and bush plane flightseeing, cultural tours and more. Overnight in Fairbanks. Start your day with an included, fun-filled Fairbanks City Tour & Riverboat Discovery Cruise. This morning visit the Museum of the North, situated on the campus of the University of Alaska Fairbanks. Here you will find a large collection of Alaskan artwork and historical exhibits. You’ll have free time in downtown Fairbanks for shopping and lunch on your own. Then board the Riverboat Discovery, a vintage sternwheeler, for a journey into Fairbanks’ pioneering past, guided by a family that has made a living on Alaska’s rivers for five generations. During your cruise a bush pilot will take off and land his plane right next to your boat! The pilot will also talk about the vital role bush planes play in remote areas of the state. During the cruise the boat will stop alongside the Trailbreaker Kennels, founded by the late four-time Iditarod champion Susan Butcher, so you can watch sled dog puppies in training and a mushing demonstration. Then you’ll land at an Athabascan Indian village for a guided walking tour to introduce you to the everyday lives and enduring traditions of the people whose ancestors settled here thousands of years ago. You’ll have time to explore the village on your own before your return to the dock, where you’ll find a large general store for some brief shopping. Overnight in Fairbanks. Leave Fairbanks this morning and enjoy amazing views as you travel on the Wilderness Express train to Denali. Spacious and luxurious glass-domed passenger cars feature comfortable, reclining seats on the upper level. There is an optional breakfast service available in the dining area on the lower level of your train car; enjoy Alaskan specialties like reindeer sausage and blueberry pancakes, if you like, or just sip a coffee and watch Alaska’s beauty pass by. Upon arrival at Denali National Park, you’ll be transferred to the Denali Park Village Lodge, located just south of Denali National Park and nestled along the banks of the Nenana River. The lodge has a restaurant, bar and gift shop in the main building, and there’s a small shopping village on the property. Enjoy free time relaxing at the lodge or hiking the trails on the property, or perhaps book an optional excursion. Your Adventure Specialist can tell you about the many activities available, including the Husky Homestead Tour or Cabin Nite Dinner Theater. Overnight in Denali. Today you’ll visit Denali National Park, an exceptional place to connect with nature. Only one road extends into the untamed wilds, cutting through evergreen forest and up into higher elevations that open out into tundra and river valleys extending up to the Alaska Range. Majestic Denali, North America’s highest mountain at more than 20,000 feet, is often shrouded in cloud cover, but if you get lucky, you might get a peek of the peak! On your included, day-long Tundra Wilderness Tour private group excursion, you’ll take a bus ride with a sharp-eyed guide who will be on the lookout for the park’s wildlife, including Denali’s Big Five: moose, grizzly bears, caribou, grey wolves and Dall sheep. You’ll catch a glimpse of creatures, large and small, as you ride along, and the guide has a video camera that will close in on far-off animals and project images to video screens on the bus for everyone to see. The bus makes comfort stops throughout the park, and a snack box and bottle of water are provided. The rest of the afternoon and evening are yours to participate in an optional activity, such as whitewater rafting, helicopter flightseeing or the Cabin Nite Dinner Theater show. Overnight in Denali. Your morning is open to book an optional land excursion, such as Nenana River Rafting. In the afternoon, sit back and relax onboard the Wilderness Express on a scenic train journey to Talkeetna, a small community on the south side of Denali, 113 miles north of Anchorage. You’ll have the option of having lunch on the train, if you like, and the menu always includes fresh Alaskan salmon. Arrive at the Talkeetna Alaskan Lodge, set on a ridge just above the artsy little village of Talkeetna, late in the afternoon. This town of just 800 people welcomes climbers from around the world seeking to conquer the surrounding mountains. The lodge features a 46-foot-high river rock fireplace in the lobby and unforgettable views of Denali and the Alaska Range (cloud cover permitting), plus casual and fine dining featuring Alaskan specialties. There’s a complimentary shuttle to the nearby town, where dining and shopping options line a two-block-long main street. Be sure to visit Aurora Dora’s cabin to see her amazing photos of the Northern Lights, and try a signature microbrew like Mother Ale at the Denali Brewing Company. Overnight in Talkeetna. Your day is open for exploration or participation in optional activities, such as a float trip on the Talkeetna River. The lodge offers a wealth of optional activities right outside your door, including ziplining, jet boating and flightseeing, or take the complimentary shuttle into town for souvenir shopping or lunch. Late in the afternoon, take in the amazing scenery from the Wilderness Express on your way to Anchorage, Alaska’s largest city. You’ll have the option of having dinner onboard the train. Arrive at your downtown Anchorage hotel in the late evening. Relax or step out to explore this diverse city surrounded by mountains, forest, rivers and tundra. The locals say, “Anchorage isn’t Alaska, but you can see it from there!” You’ll stay at the Anchorage Marriott Downtown, located in the city center and within walking distance of shopping and dining. Overnight in Anchorage. This morning you’ll visit the Alaska Native Heritage Center to learn about the various native cultures that call Alaska home. More than a museum, the center is a forum for the storytellers, dancers and artisans who are dedicated to sharing their heritage with visitors. See Native Alaskan demonstrations and walk through recreated homes on the center’s 26-acre wooded campus to learn how the Yup’ik, Iñupiaq, Athabascan, Tlingit and Alutiiq lived. You’ll have a short time in downtown Anchorage for lunch on your own or shopping before your journey continues south to the harbor town of Seward. Your motorcoach will drive along Seward Highway, one of only 15 drives in America designated an “All American Road.” The two-lane highway follows the Turnagain Arm for 125 miles with magnificent vistas of Cook Inlet and the snow-capped Chugach Mountains in the distance. At Seward you’ll board the Radiance of the Seas, a Royal Caribbean International® ship, for the cruise segment of your Alaska adventure. Your ship sails this evening. Enjoy dinner and live entertainment at your choice of onboard venues. Dinner aboard ship is included; overnight aboard ship. Your cruise ship provides you with a front-row seat for viewing the translucent blue Hubbard Glacier, one of Alaska’s most active masses of ice. Nicknamed the “Galloping Glacier,” Hubbard moves faster than almost any other glacier on the continent. Advancing 30 feet per day in Disenchantment Bay, the glacier is constantly calving. A National Park ranger will join the captain on the bridge this afternoon to describe the action as it unfolds. Keep an eye out for humpback and orca whales, who often frolic in this area. Your ship is designed for scenic sailing, with a glass-enclosed central atrium, elevators facing out to the sea and floor-to-ceiling windows throughout, in additional to ample outdoor deck space. All meals aboard ship; overnight aboard ship. PLEASE NOTE: Scenic cruising in Disenchantment Bay is dependent on weather conditions. See the highlights of Juneau, our most remote and beautiful state capital city, on your included, full-day Best of Juneau & Whale Watching excursion. Discover Juneau’s historic sights and the pristine natural beauty of its mountains, glaciers, fjords, lakes and wildlife. First stop is the Mendenhall Glacier, an enormous ice river that flows down the valley and into Mendenhall Lake. It’s Alaska’s most-visited, drive-up glacier. An elevated viewing platform allows visitors to look for spawning sockeye and coho salmon—and the bears that eat them—or take the glacier viewpoint trail for a closer look at the glacier and an awesome waterfall. Next take a short drive to Auke Bay to board a warm, comfortable catamaran for a whale-watching cruise through Stephen’s Passage, an area renowned as a favored summer feeding ground for humpback whales. They often come close enough to the boats for you to hear them breath! An onboard naturalist will talk about the behaviors and habitats of the whales and the other marine life you may encounter, like orcas, sea lions and porpoises. Step ashore at Colt Island for a delicious Salmon Bake Feast and get a taste of reindeer sausage. After lunch you’ll head back to the ship or have free time in Juneau’s compact downtown to peruse the shops, visit the State Capitol or one of the city’s fine museums. They’re all just a short walk from the cruise pier. Breakfast and dinner aboard ship; lunch on your excursion; overnight aboard ship. The era of the Klondike Gold Rush comes alive in Skagway, the gateway to the Yukon Territory. Your included, full-day Alaskan Gold Rush Experience excursion begins aboard the historic White Pass and Yukon Route Railroad for a fascinating scenic rail journey. In the late 1800s, building a rail link from the boomtown of Skagway to the goldfields through vertical granite cliffs and deep chasms seemed an impossible feat. A determined engineer completed this railway in 1899, and it has been declared an International Historic Civil Engineering Landmark. Ascend nearly 3,000 feet in 21 miles by rail past Bridal Veil Falls, Inspiration Point and Dead Horse Gulch on vintage narrow-gauge parlor cars. See the original Klondike Trail of 1898 that is worn into the rocks, a permanent tribute to the thousands of adventurers who came here in search of fortune. Your rail journey ends in Fraser, British Columbia. Your motorcoach will travel the scenic Klondike Highway to White Pass Summit, where you’ll pause at the “Welcome to Alaska” sign at the Canada/United States border. Next catch gold rush fever and learn to pan for gold at Alaska 360’s Dredge Town. Costumed “prospectors” will show you the ropes; you can keep any gold you find. Enjoy a buffet lunch and taste an array of traditional Alaskan specialties like Alder smoked wild Alaskan sockeye salmon and country spare ribs prepared on a massive outdoor barbecue grill. After lunch you can choose to go back to the ship or be dropped off in downtown Skagway to shop and explore on your own. Breakfast and dinner aboard ship; lunch on your excursion; overnight aboard ship. You’re on your own today at Icy Strait Point, the largest native Tlingit Indian settlement in Alaska. You can choose to shop or dine at the fully-restored 1930s fish cannery, or watch for humpback or orca whales from the shore. You might prefer to book an optional fishing excursion, ride the world’s largest and highest zip line ride or learn the rich history of the Native people at the Tribal Dance & Cultural Legends Show. You have all of these optional activities and more from which to choose. All meals aboard ship; overnight aboard ship. Nestled between the sea and the rainforest, Ketchikan grew around salmon canneries and sawmills. Today you’ll have a wilderness experience you’ll never forget on your included Bear Country Wildlife Adventure. This private group excursion starts with a scenic drive in downtown Ketchikan and past Creek Street, where you’ll see many colorful, historic buildings set on wooden pilings. Travel to the Alaska Rainforest Sanctuary, where you’ll have a guided 3/4-mile hike through the forest with a naturalist in search of the black bears attracted to the large salmon runs in the stream by the Whitman Hatchery. Walk along an improved trail through dense stands of hemlock, spruce and Alaskan cedar. Your walk ends on above-ground platforms and bridges which maximize your viewing and provide protection. Only a limited number of small groups have access to this exclusive bear-viewing area, to limit environmental impact. Mink, marten and wolf frequent the area as well; bald eagles wait for scraps left by the bears; and seals can often be seen feeding on the bountiful fish harvest. Walk through the historic Herring Bay Lumber Company Sawmill to observe a Native carver crafting a large totem pole on your way to the Alaska Wildlife Foundation, a nonprofit organization where you can feed Alaskan reindeer and see raptors up close. Then take a short drive to rustic George Inlet Lodge for a hearty lunch of fresh Dungeness crab. Your dining host tells tall tales and assists each table of guests in the Crab Shell Stacking Competition, the finale of every Crab Feast. It’s a rowdy good time! After your excursion, you’ll still have time for shopping in downtown Ketchikan before the ship departs. Breakfast and dinner aboard ship; lunch on your excursion; overnight aboard ship. PLEASE NOTE: For those with mobility issues that would prevent them from taking the 3/4-mile hike in the Alaskan Rainforest Sanctuary, the bus can take you directly to the nearby Alaska Wildlife Foundation. Upon leaving Ketchikan, your ship will cruise the Inside Passage, a pristine protected waterway dotted with thousands of islands. You’ll have a good chance to observe orca whales and other wildlife as you sail this narrow waterway. Tonight join your Bluegreen hosts and fellow owners at a Farewell Cocktail Reception before dinner. All meals aboard ship; overnight aboard ship. Your Alaska adventure ends this morning with disembarkation in the picturesque Canadian city of Vancouver and transfers to the airport. Breakfast is included today. Call 800.459.1597 to Book Your Alaska Owner Adventure Today! **BLUEGREEN TRAVEL SERVICES ONBOARD CREDIT OFFER TERMS & CONDITIONS: $50 onboard credit per stateroom available when booked through Bluegreen Travel Services by April 17, 2019. Onboard credit may be used for select purchases aboard the cruise ship and has no cash value. New bookings only. Subject to availability. Terms and conditions apply. Prices are per person, based on double occupancy, for specific sailing and stateroom categories. Government taxes and fees are additional. For new reservations only. Subject to availability. Certain restrictions apply. May not be combinable with any other promotion and may be withdrawn at any time. “Deals” pricing reflects the special rate(s) you may be eligible for. Proof of eligibility required. If eligibility cannot be validated, you will be charged the standard rate or denied boarding. All prices are quoted in US Dollars. All itineraries and prices are subject to change without notice. Please review the Cruise/Cruisetour Ticket Contract for complete Terms & Conditions. Ships’ Registry: Bahamas. © 2011 Royal Caribbean Cruises Ltd. Royal Caribbean International Operator reserves the right to impose a supplemental charge relating to unanticipated occurrences including, but not limited to, increases in the price of fuel. Any such supplement charges may apply, at Operator’s sole discretion, to both existing and new bookings (regardless of whether such bookings have been paid in full). Such supplements are not included in the Cruise or CruiseTour Fare. Price is per person based on double occupancy, cruise and land tour only, for select sailing date and stateroom category. 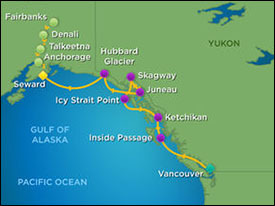 Includes airport transfers in Fairbanks on July 13 and Vancouver on July 26; all meals aboard ship; excursions as noted in itinerary; $50 onboard credit per stateroom; Farewell Cocktail Reception aboard ship; on-tour motorcoach transportation; gratuities for Adventure Specialists, tour guides, drivers and cruise staff; and port and security fees and taxes. Prices, additional fees, itineraries and availability are subject to change without notice. Fares shown are in U.S. dollars for new reservations only and are subject to availability. Reservations must be booked by December 15, 2018. A non-refundable, non-transferrable deposit of $500 per person is due at time of booking. Final payment is due by March 15, 2019. Please call us at 800.459.1597 for more information. Offer includes Farewell Cocktail Reception invitation for first and second guests in cabin only. Limit one ticket per paying passenger for included shore excursions, as noted. Onboard credit may be used for select purchases aboard the cruise ship and has no cash value. Certain terms, conditions and restrictions may apply. These offers may not be combined with any other offers/promotions and may be withdrawn at any time. Not included: airfare; travel insurance; car rental; items of a personal nature; restaurant fees; some beverages; and photographs. Great Vacation Destinations, doing business as Bluegreen Travel Services, is located at 12400 S. International Drive, Orlando, FL 32821. Great Vacation Destinations is registered with the State of California as a Seller of travel Reg. No. 2068362-50 (registration as a seller of travel does not constitute approval by the State of California); Washington Seller of travel Reg. No. 602-283-711; and registered with the Airlines Reporting Corporation (“ARC”) number 15-72225-4. In the event of a conflict between Royal Caribbean International’s Details of Participation and Great Vacation Destination’s Details of Participation, Great Vacation Destination’s Details of Participation shall govern.